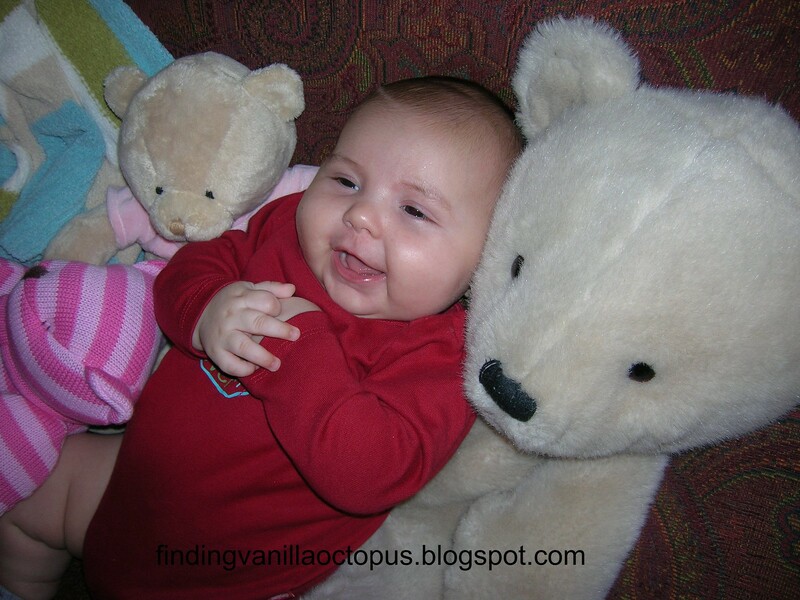 It feels like only yesterday that I was writing about Abby turning two months old. Pretty soon, I'll be catching up to where Michael is now, and what an interesting experience that will be, comparing where she was to what he's doing. One way in which I already know that their developments have converged is the timing of the appearance of their laughter. Both of them started up spontaneously at exactly three months. Well, maybe not both (Michael required quite a bit of encouragement, in the form of tickling). With Abby, it was a completely unexpected reaction when I started up an impromptu game of peek-a-boo, which actually happened the night before she turned three months. The next day, when I set her up for pictures, I had a video camera ready, hoping to repeat the scenario. She complied, in a big way, and I got a perfect little clip of her belly laugh. Sadly, that video is stored on my laptop, which has been dead for nearly a year. At some point in the future, I will get all of the data off of it, but I have not done so yet. In the meantime, if you're friends with me on Facebook, you can look it up. It's a little ditty called Peek-a-boo with Mommy. That outfit, by the way? Size 12 months. Around this time, we received a shiny new highchair in the form of a gift. It is still a huge mystery to us who sent it, as there was no gift card, and BRU does not have a "Thank You Card Manager" function on their on-line registry. 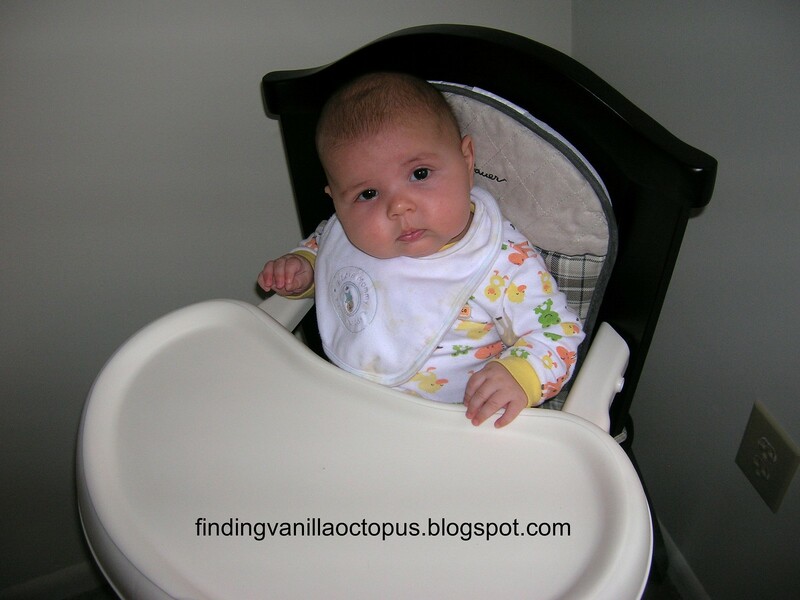 Even though it would be a few more months before we started solids, we placed Abby in it from time to time, just for fun. I believe that this was the first time. First Super Bowl party, hosted by her Godparents (well, soon-to-be; she wasn't baptized for another couple of months). Here she is, with her Godmother, Kelly. 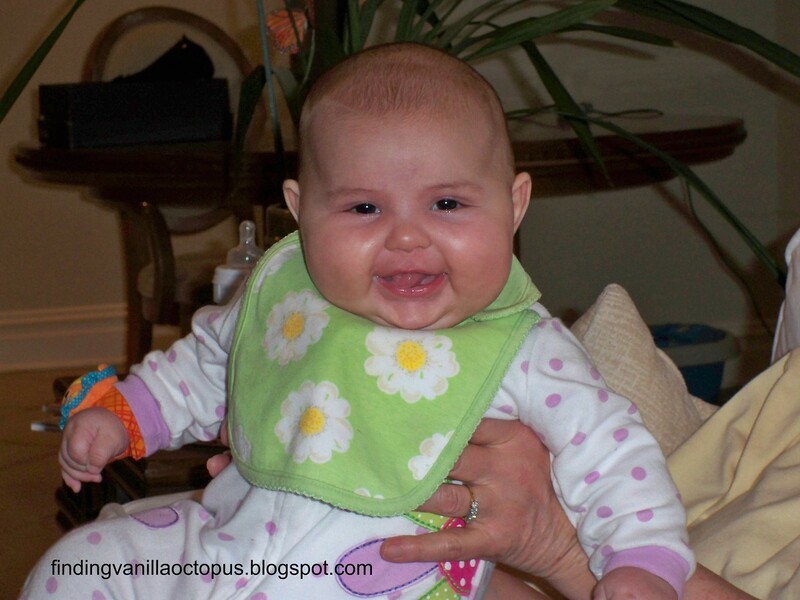 You will nearly always see her in a bib from this point onward (except for the official "month" shots), because she began teething, and drooling, big time, and continued with the drool-fest for many, many months. First time in the crib. We took this picture after finally purchasing a crib set for it. However, she didn't begin to sleep in it regularly for about two more months. You see, around this time she began sleeping through the night (we're talking 10 hours straight). She gifted us with a whole week of this, but then we traveled to New Jersey, which was disruptive, and it was on our return that we decided to go ahead and move her to the crib, reasoning that she hadn't been in her bassinet for the week that we were away, anyway. She continued to wake once or twice a night, as she had done during our travels, and desperate to get her back to sleeping through, I returned her to the bassinet in our room. Unfortunately, this did not solve the problem, but since I had to get up to tend to her, she stayed in there with us until she did start sleeping through again, at around five or six months old. First time holding a bottle. Well, sort of. This picture was a fluke, and we knew it at the time but took it for fun. Little did we know that she would actually refuse to hold her own bottle until she was 16 or 17 months old (which, at that point, was really a tall, soft-spout sippy). Up until the last month or so that she took a nighttime "bottle," we had to give it to her tipped backwards in our lap, because she was too stubborn to hold her arms up while she chugged. Compare that to now, when she has boycotted straw sippies, because she wants to tip her cup back like Mommy and Daddy do, thus defeating the purpose of a straw. My stubborn little monkey-child. First time in an activity center. This was during our visit to New Jersey, where Nana purchased it just for Abby to use. I am struck by how interactive she is- reaching for the various components in front of her. I remember very clearly how focused she was on that frog, how she would flip it around and move the rings to either side of it up-and-down. I did not remember this happening during her fourth month. I don't like to give in to comparing my two children overly-much, but I don't remember Michael being quite so hands-on at that age. He was certainly very interested in what went on around him, but he was much more of an observer. Of course, I think a large part of that has to do with the fact that he spent a lot of time being worn or in Tom's or my arms, and wasn't willing to be put down to play independently (this is still, unfortunately, true, a large percentage of the time). If ever a baby needed a fourth trimester, it was him. In fact, I think he needs a fifth and sixth. But that's for another post. And here are two of my favorite pictures from that month.